Thai dowry must be one of the most discussed issues on Thailand web boards. 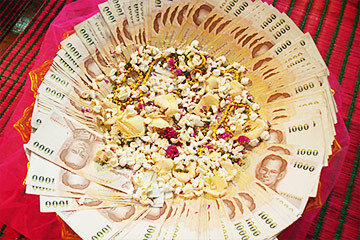 The Thai dowry system is known as the ‘Sin Sod’. Traditionally, the groom will be expected to pay a dowry or sin sod to the family, to compensate them for the loss of their daughter. The dowry or sin sod is also to demonstrate that the groom is financially capable of taking care of their daughter. The idea of “paying” for your bride is deeply embedded in Thai culture and is considered absolutely normal. Most Westerners however find this idea somewhere between distasteful or an absolute scam. The concept of dowry is not a Western concept as many Westerners believe in romantic love and that money has nothing to do with it. Usually, the dowry is symbolic and will normally be returned to the couple after the wedding. Thai parents tend to view marriage as being based on financial security. Hence the dowry or sin sod. No Thai family would want their daughter to marry someone who does not have an interest in the financial security of the family. This makes the dowry a must during a Thai wedding ceremony. Look at dowry from a Thai perspective. Cultures and traditions are different. As an example when a Thai man marries a woman he would generally move into the family home. It would then become his responsibility to manage his in-laws business be it a farm or a store. He would also be tasked with taking care of her family members and anyone related to her family. Should he fall into financial difficulty her family would then support him. The concept of dowry or sin sod even though alien to Westerners shows how closely knit Thai’s are compared to Westerners who are more individual in deed and thought. What is normal in the West such as “old age homes” or old age pensions are not standard in Thailand. Children take care of the family during their retirement years. The dowry is therefore important in Thai culture. In Thailand inheritance of the family home and family land is generally through the female children. Dowry however is not linked to it directly. The husband of the daughter in the family would therefore reap the any benefit of all that might have been achieved by his wife’s parents. Unfortunately being a foreigner you don’t benefit from the equation. Firstly a foreigner cannot own land or a house in Thailand in his name. (Consult a reputable law firm to discuss your options). It is the lack of benefit that most foreigners object to paying dowry. Even though some Westerners object to the concept of dowry, many simply disagree with the amount payable. The amount of dowry paid usually depends on the social status of the family and/or the level of education of the bride or her income alternatively both. A dowry of a million baht for an uneducated woman is unheard of. A Dowry for an average middle class educated Thai would normally be in the region of 100,000 Baht. This varies as an example, should the bride be a divorcee or a “Mia Maiy” – a spoiled/ruined wife, normally no dowry is paid. If she has a child or children from a former marriage or relationship no dowry is paid either. Thai Dowry is a touchy subject in Thailand with Westerners. Normally you or someone in your family approaches the Thai woman’s parents to negotiate” Tong Mun” and “Sin Sod.” Tong Mun which literally means “gold engagement” is in reality 24 karat gold jewelry given to the bride. The concept is similar to an engagement ring in the West. Sin Sod is the dowry itself. The word “Sin” means riches. This could be anything of value. In Africa it would include farm animals, land and such. “Sod” on the other hand is the act of storing or in this context holding the “Sin”. Hence the term Sin Sod or dowry. The “Tong Mun” or engagement ring will be presented to the bride at a ceremony called a “Phitee Mun,” which normally takes place at the bride’s parent’s home. This is mainly attended by family members and shows acceptance into the family. You and your prospective bride are now viewed as a “Koo Mun” which literally means “tied or joined couple,” (engaged party). Ever seen a Westerner in Thailand with loads of string tired around his wrists? He partook in a “Bai Sri Soo Kwan” or engagement ceremony. The engagement ceremony concludes with each guest tying a string around the wrist of the bride and that of the groom, while giving the married couple their blessings, followed by the placing of a garland of flowers around the couple’s necks. This is followed by the “Koo Mun,” or the actual wedding ceremony a few weeks later with the presentation of the dowry. Dowry however does not play a role when registering a Thai marriage. There is no need to show that dowry had been paid as it is not part of the legal system. Dowry is a tradition not a law. Consult a reputable law firm in Thailand to handle your Thai marriage registration and/or a prenuptial agreement. They will do all the necessary translations and processing once you hand over the required documents.